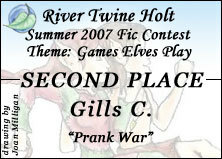 (2007 Games Elves Play Contest) A dare is set, and four pranksters set out to the find who does it best. "This has got to stop." Windburn pinned each of the four elves lined up in front of him with a steely glare. "Now." It'd started with Notch, although of course he never admitted it. He'd wink and smile and never give away the game fully, but he'd been the one to start it, boasting about snatching a whole pile of nuts away under the noses of angry squirrels. They'd been lying on the sun-warmed stones by the river, him, Rainpace, Willow and Chicory, who was fishing and opened one eye, growling at them to restore the silence she needed. "That's too simple." Willow rolled over. Rainpace, in a rare moment of stillness, quirked an eyebrow. "Stealing from a squirrel. There's no real challenge to it." "Oh?" Notch grinned and popped a nut into his mouth. "Think you can do better?" Looks were exchanged The challenge had been set. It was war. Willow thought she'd been terribly clever. It'd been both risky and difficult to liberate the entire stack of perfectly straight branches Longshot had wanted to make arrows out of, and after some thought she decided to only use four, knowing that would be quite enough. She'd snuck away for a whole day, working on them with water and wax from her hives. When Longshot woke up that evening, four of his formerly straight arrow-sticks had been twisted into knots as fancy as Cloudfern's hair. The archer had raged for hours, but Willow was nowhere to be found. By the time he discovered the branches could be straightened out again, with some help from Evervale, she was far far away, giggling to herself. When she returned to the Holt she got respectful looks from Notch and Chicory, and a scowl from the chief, but no real harm was done. All four waited for the next prank. They all had to admit Rainpace was the most patient of all of them, so when Blacksnake tried to pull on his pants a few days later and found the leg-holes sewn closed, just when he was in a hurry to get dressed and out of his den, they were all fairly sure it was his doing. The fact that they all needed to hide away for a day, and that Rainpace was assigned to cover up the Holt's old waste-dump areas on his own was entirely worth the look on Blacksnake's face when he'd nearly toppled out of his den. His pants never quite recovered their former glory, either, and One-Leg mentioned the incident every chance he could, to the general merriment of (almost) everybody. But people were starting to notice them. It was easiest for Chicory of all of them to think something up that'd be silly, cause certain people a lot of trouble, and still hopefully not become anything too disruptive. She simply spun a long tale for Crackle and Otter about an acorn that would make you a giant if you ate it- and not just an old acorn either, but one hidden somewhere around the Holt. After two days of the little menaces crawling through everyone's dens, upsetting everything, snooping under furs and pots and (once) waking Kestrel up because she had absolutely, definitely gone to sleep right on the acorn, Chicory let slip that the last person who'd had the acorn had buried it somewhere around the Holt. They two youngsters peppered the entire Holt with holes until their parents put a firm stop to it. Days later, people were still stumbling over them. When an unbonded wolf nearly broke his leg in one, Chicory took it upon herself to refill every single one back up. Windburn watched as Crackle and Otter wondered why their favorite adult-who-wasn't-mom-or-dad was spoiling her own game, and said nothing. They never did find that acorn. In the end, again, Willow knew she had the best idea, the true masterpiece. It was the peak of the hot season, the best time for the juiciest dreamberries, and Starskimmer was at her brewing all day and all night. Sneaking into her tree during those few days took both cunning and daring, as well as some careful acrobatics. The beekeeper shamelessly recruited Otter and Crackle to help her distract Starskimmer for a while, then crept into her brewing tree, crawled up to the newest batch, the one that was to be opened at the next Howl, and added a handful of the white crystals they scraped off the rocks by the vast water and used to preserve food. It was definitely enough to be felt, and there was plenty more wine from older batches that the party wouldn't be ruined. She smirked, made sure she'd left no marks of her visit, and snuck away again. An eight of days later, a successful hunt called for a Howl, and the newest jug of dreamberry wine was brought out. After the initial howling was done, Windburn raised the jug high- and Willow suddenly got the idea that this might not have been the very best of ideas. If she'd been looking more carefully, she'd have noticed that Notch, Chicory and Rainpace wore expressions quite similar to her own. Windburn raised the jug again, thanking Starskimmer for her gift to the tribe, and tilted it to his lips, taking a deep swallow. He choked, sputtered, and spewed out the liquid, followed by a stream of curses. The jug went flying, saved by a very fast action from Thornbow who caught it at the last second. The clearing filled with questions and cries of dismay, the loudest coming from Starskimmer, of course. "It's- it's-" Windburn recovered from his choking fit, though his face was a fascinating shade of purple, and he was quite speechless, "You try it!" 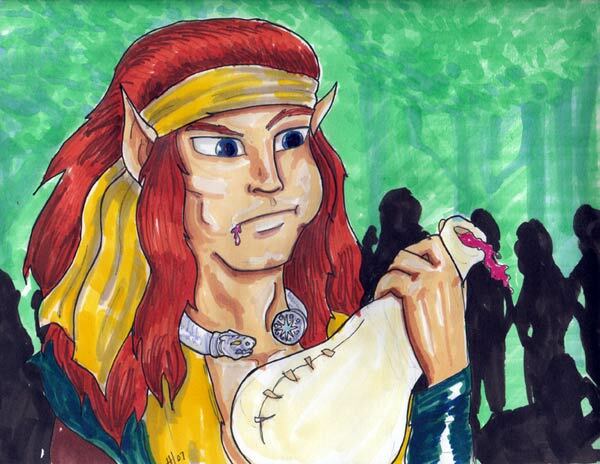 Starskimmer took the jug from Thornbow, slowly sniffed it, then touched her tongue to it. "Ugh!" She recoiled sharply. "What- I didn't make this!" The look she turned on the others was flushed with anger, "Someone tampered with my wine!" Willow held her breath- surely she hadn't put in enough salt to make it that horrible�She looked at Notch- he was flushed as well, and looking very worried. She next looked at Chicory, who was pale as whitest sand, and looked just as worried. Then, she looked at Rainpace, who looked back at her. For a few moments, there was silence. Then Notch started laughing, Chicory joined him, followed closely by One-Leg and True-Edge. The cubs laughed because the others were laughing and they were glad the yelling had stopped. Soon enough, even Willow was forced to join the general hilarity, as the entire tribe except for Starskimmer and Windburn broke the tension with gales of laughter. "I'm- sorry Starskimmer." Kestrel was the first to recover. "But- but the look on your face! It's only wine, after all." "It didn't happen on its own!" Starskimmer insisted. Her good name as a brewer was on the line, and she refused to back down. "I demand to know who did this." "I think I can tell you." Snowfall stepped forward and turned to face the others as the laughter died down. She scanned their faces for a long moment. "Rainpace. Notch. Willow, and Chicory as well." Six jaws dropped in six faces. "All of us?!" The four younger elves stared at each other. They could have. But they had. There was another beat of silence before Notch started laughing again, so hard that he had to sit down. "Oh mother, I'm sorry. But it was such a good idea! How could we not do it? I can't believe we all salted your wine." "You did, didn't you?" Starskimmer advanced on her son, hefting the jug, and would've thrown it at his head if Snowfall hadn't caught her arm and led her away. Windburn glared at them all. "You four, come with me. The rest of you continue the Howl, we'll be right back." "This has got to stop." They were facing him, lined up a short distance from the Holt. "Now." There was nothing any of them could say. Chicory tried anyway. "We're sorry. We didn't mean any harm." "I'm sure you didn't, but you hurt Starskimmer's feelings." And made him look like a fool in front of the tribe, which was almost as bad. "The next time, somebody might get hurt." He glared at them again. "A prank contest, am I right?" "Yes Chief." Rainpace sounded appropriately cowed. "Then I think I can sort it out for you." Windburn announced. "Notch, you said this was the best idea?" "Yes Chief." Even the irrepressible Notch was subdued. "Then you all had the best idea?" They nodded, and Windburn nodded once, sharply. "That's it then. You're all the best prankers. Let this be the end of it." He looked at each other them in turn. "Notch- you I'll leave to your mother to handle." Notch swallowed hard. "Rainpace, you'll help Starskimmer clean out that jug, and brew new wine." Rainpace sighed- it would be hot, sticky work in a closed space and not at all fun. "Chicory�" He gave his sister a deeply disappointed look and she looked so miserable he shook his head, "You're too old to get involved in these things." "I'll�give Starskimmer all the beesweets I can find this summer, to make up for a salty batch?" She suggested. "Half is enough." The Chief seemed satisfied with her suggestion. "Remember, we need it for other things. No sweets for you four, not until you apologize to Starskimmer and she accepts your apology." They all nodded, knowing it could be a while before the brewer calmed down enough to forgive them. "Good. Let's go back to the Howl now." He turned away and started walking without waiting for them. "Mother is going to chew my ears off." Notch lamented. "You walked right into that, you know." Chicory sounded sympathetic despite her words. "It could've been worse." "Sure." Notch grinned. "I could've lost!" "You did lose." Rainpace poked him in the back. "I did not, your heard the Chief. We all won." "No, we all lost." Rainpace insisted. "So�We still don't know who the best pranker is, do we?" Willow started to grin as well. Chicory screamed in frustration, threw up her hands and left them behind, muttering curses under her breath as they all started laughing again.